View home security camera coverage on your smartphone. Ooma’s wireless home security camera smartphone control lets you keep an eye on your home 24/7. No matter where you are, you’ll get peace of mind with real-time home security alerts via text, email or phone call. 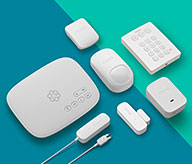 Powerful, mobile-friendly home monitoring features. Ooma Smart Cam is 100% wireless with onboard battery and storage. When paired with your iOS (Apple) or Android device, you can enjoy features like instant video capture, two-way talk, and auto privacy mode, among others. Whenever the Ooma Smart Cam detects motion or sound, or if the camera has been moved, the camera communicates via wifi to stream surveillance video instantly to your Ooma Smart Cam cloud account. Your smartphone-controlled security camera will then alert you through the app whenever a new video clip is uploaded. Why is this important? Smartphone-compatible cameras ensure you are up-to-date on everything that is happening with your security system, even if you are miles away from home. Watch the video to see how easy it is to use the app and get the system up and running. Never miss a thing with smartphone security footage. Maybe you’re at the office and want to check in to see if the kids got home safely. Perhaps you’re on vacation and want to check in on your home’s status. No matter the reason, the Ooma Smart Cam mobile app gives you 24/7 access to your camera so that you don’t miss important timeline events or video/audio footage. Not only does this app give you a real-time look into your home’s status, but it gives you peace of mind while you’re away. 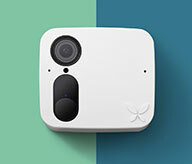 To learn more about Ooma Smart Cam, visit our home security camera systems page for a more in-depth look at the camera’s features and benefits.